Hopefully today's card will brighten up your Monday. 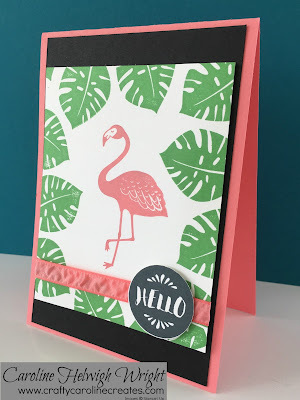 Pop of Paradise is such a cheerful stamp set - it just makes me think of tropical islands and sunny days. The leaves are stamped in Cucumber Crush - such a bright bold green which I am really going to miss when it retires at the end of the month. I think they should make it a new member of the Brights family! The flamingo, the ribbon and the card stock are Flirty Flamingo of course. And isn't it strange that the black matt actually seems to make the rest of the colours even brighter!